Deciding where to set up your business is often a daunting decision. Location can have a huge influence on your success, impacting overhead costs, connectivity, accessibility and much, much more. – so it’s important you get it right. To help you decide where’s best to set up business if you’re a millennial entrepreneur, we’ve analysed the UK’s 20 biggest cities based on costs, connectivity and other things important to the millennial generation. As a millennial start up ourselves, concerns about costs weighed more heavily on us than they might’ve done for older entrepreneurs. Millennial start-up owners will have spent less time in the workplace, so they’re less likely to have the same level of capital and established network as older counterparts. Research suggests that millennials invest far more in creating sustainable lifestyles, with 70% going the extra mile to source eco-friendly goods and services where possible. Millennials are also likely to factor in connectivity more when planning a start-up location. Millennials have a particularly high opinion of the internet, with three-quarters (73%) thinking it has been good for society, compared to just 65% of over 55s. It’s because of these generational differences that we wanted to look into start-up locations specifically for the millennial generation, to help people looking set up a business find the best place to do so based on what’s most important to them. Once this data was compiled, each factor was given a percentile score for each city. These scores were added together, giving a total score for each location, which then created our top ten. Scotland’s capital kicks off our top ten. Its strongest point lies in the number of start-ups appearing in the city. As of 2016, Edinburgh had over 13 start-ups per 1,000 people living in the city – the highest in our top ten. Edinburgh also performs well when it comes to recycling, with 41% of the city’s waste being recycled in 2017/16. Edinburgh is let down by its cost of living, which is the highest in our top ten. This could make the Scottish capital a tricky place to get a business off the ground. Other shortfalls are the price of coffee – at £2.66 a cup this is the highest in our top ten. Train reliability is also a stumbling point with 42% of trains passing through the city’s major stations leaving or arriving late in 2017. Wales’ capital city has just outstripped Scotland’s to sneak into ninth place. 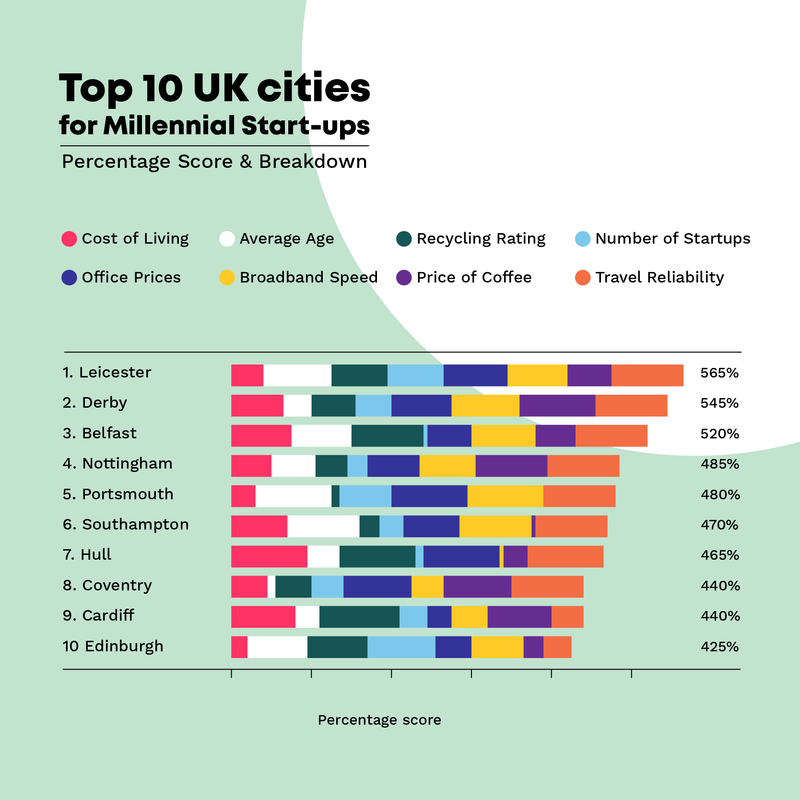 Cardiff’s low cost of living offers great opportunities for millennial start-ups, while other strengths come in the form of excellent environmentally friendly stats. An impressive 58% of all waste in the city was recycled in 2017, making Cardiff the only location in our top ten to recycle over half its waste. The city’s low-to-middling scores in number of start-ups and office prices stop it rising any higher in our top ten. Coventry has the same total score as Cardiff, but just beat out the Welsh capital to take 8th place owing to the slightly higher number of start-ups per 1,000 people and its excellent record for travel reliability. Coventry also excels when it comes to value for money in office space. At just £16.50 per square foot, Coventry is the third cheapest city in our top ten. The city’s prices are also low in that other key entrepreneurial resource – coffee. An average cup will cost you £2.44, again the third cheapest in our top ten. 2017’s city of culture is also one of the best places for UK millennials to set up their business. The northern city offers great value for money for millennial entrepreneurs, with the lowest cost of living in our top ten. Hull also comes in second for amount of waste recycled and joint first for cheapest office prices – at just £16 per square foot. One of the biggest downfalls for Hull is the availability of quality broadband. The city has the lowest percentage of properties with superfast broadband of any city on our list. Although being in the north might seem far away from the hub of UK business, Hull also rates highest for travel reliability, so you’ll still be able to get where you need to go. Number six on our list has consistently high scores across a number of ranking factors. Southampton’s low cost of living, average age and office rental prices helped get it in the top ten. What pushed it to number six was its stellar broadband speed. Southampton has the second highest proportion of properties with superfast broadband in our top ten. Southampton is one of just two locations in the south of England to have made this list. It’s close proximity to London could give you an edge if major players from your industry are in the capital. The second of the southern cities in our top ten is Portsmouth. Although cost of living and average prices for coffee are above Southampton, Portsmouth beat out its southern rival due to its low average age (second lowest in the top ten), cheap office prices (joint lowest in the top ten) and good broadband connectivity. Portsmouth could be a good choice if you’re likely to be travelling internationally. Not only is it closer to London and its slew of airports than many northern alternatives, you can also take the ferry to reach the European mainland. Journeying back to the midlands for number four sees Nottingham enter the top ten list. Nottingham has a great base to work from, with a middling performance on cost of living, average age, recycling and office prices. Where it excels is on broadband speed, low price of coffee and reliable travel. The only shortcoming for the city is the number of start-ups per 1,000 people, which is fairly low when compared to others on this list. Although currently lacking in start-up enterprises, with less than one per 1,000 people living in the city, Belfast looks like it could be a great place for millennials to think about setting up their business. Its low cost of living gives a lot of buying power, also reflected in the average price of coffee. Broadband speed and travel reliability offer further benefits for those looking to start-up in the city. Northern Ireland’s capital is currently offering a lot to those looking at setting up a new business in the area, with key investors including Crescent Capital, Kernel Capital and Co-Fund. Invest NI also provides support new start-ups, so those struggling with networks and funding should find a lot here. 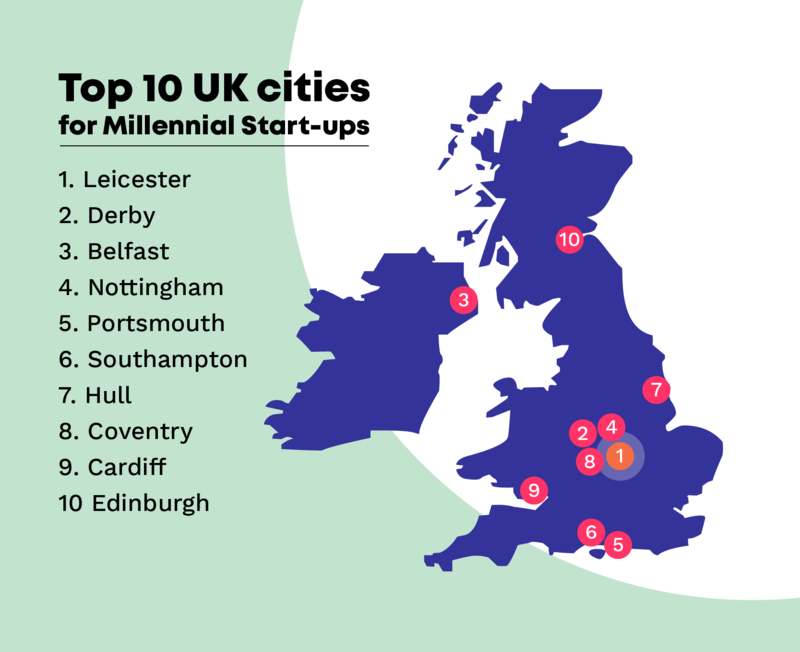 Just missing out on the number one spot for millennial start-up cities is Derby. Aside from a weak spot for average age, the city scores either mid-table or highly for every factor of the study. With a decent cost of living, low office prices at just £18 per square feet, and the cheapest coffee in the top ten, millennials who haven’t had time to establish deep pockets will find great buying power in this city. Travel and broadband connectivity both have great ratings in the city. The city’s location in the midlands will also help, with strong transport links to the entire country. If you choose Derby as your location try to drop off some booklets and print marketing at the train station to get your brand out there to people passing through. At number one in the list of best UK cities for millennial start-ups is Leicester. Leicester performs exceptionally across the board. All-important office prices are low at £17 per square foot, while average age is the third lowest in our top ten. Recycling 40% of all waste in the city means you can rest easy when it comes to the environment and with almost 11 start-ups per person, the city is supportive of new enterprises. You’ll also be able to stay connected with good broadband connectivity and travel reliability to stations across the country. Leicester is hugely supportive of its business enterprises, hosting an annual business festival which attracts 10,000+ visitors every year – so get your exhibition stands at the ready! If you’re thinking about setting up a new business, hopefully the above info will have given you something to consider in terms of where offers the best start-up hub. Consider what is most important to you and examine which of these cities will offer you the best in this.